Japanese Episode DP 178: "Goodbye, Rocket-Dan! Nyasu's Love!?" 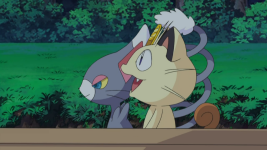 American Episode 1321: "For the Love of Meowth!" After being defeated by Satoshi and his friends, the Rocket-Dan are sent flying through the air. Nyasu is separated from his teammates and ends up meeting a trainer named Mamii and her pokemon, Nyaruma. Nyasu falls head over heels for Mamii's pokemon and decides he wants to spend the rest of his life with it. His teammates catch up to him and separate him from his new love, so Nyasu tries to convince them to go back and kidnap Nyaruma to give it to the Boss. Elsewhere, Mamii meets Satoshi and his friends. Suddenly, the Rocket-Dan attack and steal Mamii's Nyaruma! Later that night, Nyasu takes Nyaruma's Monster Ball from his sleeping teammates and runs off with Nyaruma. When Musashi and Kojirou wake up, they find a note from Nyasu announcing his departure from the Rocket-Dan! The duo furiously looks for Nyasu to tell him off while elsewhere, Satoshi and the others continue to search for Nyaruma. The two groups eventually track down Nyasu and demand he return the pokemon to its trainer. Nyasu refuses and uses the strength he's acquired from his feelings of love to fight off both group's pokemon. During the battle, a stray attack hits Nyaruma and triggers its evolution into Bunyat! Bunyat is no longer cute and has developed an unattractive personality, so Nyasu gives up trying to fight for its love. After Mamii's Bunyat uses Hyper Beam to send the Rocket trio flying through the air, she thanks Satoshi and his friends for all their help. "Goodbye, Rocket-Dan! Nyasu's Love!?" Wait...what!? Nyasu is leaving the Rocket-Dan!? Say it ain't so! It's time for the nearly annual "Rocket-Dan break up" episode, and even though we know this breakup isn't going to stick and that everything will go back to the status quo by the end of this 22 minute adventure, I still find the episode entertaining despite its derivative plot. This comedy episode is also a nice breath of fresh air after the super serious Grand Festival, and I'm happy to see Nyasu get another episode to himself. I do find it kind of weird that the TV series would have an episode focused on Nyaruma immediately after the Grand Festival battle with Nozomi's Nyaruma. Between Nozomi's Nyaruma and Ayako's Nyaruma, I'm feeling a bit Nyaruma'd out. I really liked the pokemon's trainer, though. She's like the first trainer ever to be smart enough to actually recall her pokemon into its Monster Ball when it's being stolen by a group of thieves, and I feel like that deserves some applause. It's kind of sad to think that this may be the last character-driven Rocket-Dan episode ever since the way they're carrying themselves now doesn't really lend itself to comedy episodes like this one. Will we ever see another "Nyasu falls in love" episode? Or another comedic Rocket-Dan episode, period? I sincerely hope we do, but if this ends up being the last one ever, I'm at least comfortable with the knowledge that they went out with a bang. I always look forward to episodes centered around the Rocket-Dan but dread those episodes whenever the dub gets to them, and this one is no exception. It's better than most Team Rocket episodes TPCI's dubbed, but that's not really saying much, is it? The title screen of this episode is ready by Nyasu, Musashi, and Kojirou in the Japanese version. In the dub, Ash reads it like he does in every other episode. Jessie: "Are we missing something?" James: "Perhaps a smattering of success?" Jessie: "Hm? We've misplaced Meowth." James: "Perhaps, though we were on the same flight." Originally, Musashi and Kojirou don't notice anyone missing until after Musashi recalls her two pokemon. Musashi's first line after landing in the Japanese version is that they've failed once again. This episode's character of the day, Mamii, speaks using the really super polite form of Japanese known as keigo. Lots of watakushis here and de gozaimasus there. She also tends to speak in the third person, for some reason. All of these little speech quirks are done away with in the dub. The dub also anglicizes the pronunciation of her name. In the Japanese version, her name is pronounced Mah-mee, but in the dub, it's May-mee. Meowth: "When da Boss comes out of slumber land in the morning, there'll be Glameow with that gorgeous grin. It'll be like he's got his own personal sun shinin' right there in his room." In the Japanese version, Nyasu states that Nyaruma's presence will shine like a halo. I'm guessing this was changed because of the mention of religious iconography even though I'm pretty sure Cartoon Network wouldn't have had a problem with a mere mention of the word "halo." It's not like this is the CW or anything! Meowth: "You can take that fantasy wit' a grain of salt but not the fact that I really wanna help you out!" Nyasu doesn't comment on Nyaruma's fantasy, probably because he's not psychic and would therefore have no way of knowing what she just imagined. In the second half of the episode, Jessie and James find a letter from Meowth. Jessie: "It says, "Don't look for me. I'm out of here. The long held dream the three of us shared of conquering all of Sinnoh is completely over for me."" Originally, Nyasu states that he's finished with the dream of conquering the world. He doesn't make any mention of the Sinnoh region. James: "A fine "how'd you do?" after the years of thieving bliss Team Rocket rendered." Kojirou doesn't sorta-kinda not really break the fourth wall by mentioning any passage of time. Instead, he's upset because Nyasu thought so little of the two of them that he would manipulate them to get what he wants. Meowth: "You can plant me in a field of fire but I don't care! I'll bet you big bucks I could rumble with Dialga and Palkia and they'd beg for mercy!" Nyasu tells his opponents that they can come at him with arrows or guns and he won't care. The dub decides to remove this reference to firearms and goes for describing what's going on behind Meowth instead.